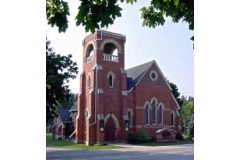 The Anglican congregation in Arthur dates back to 1846. The church services were held in various buildings and other churches until 1880 when the decision was made to build a new church on the existing property on Tucker Street, Arthur. On December 27, 1925, after 45 years, the church was destroyed by fire. The congregation built the new church for just over $10,000. The new building had a basement with a fine new kitchen. The interior of the Church was finished in gray stucco with dark oak roof arches. The new seating was finished in dark oak to harmonize with the gothic windows. The Luxfer Priam Company of Toronto supplied the glass. The bell, which for so long had served the community as a fire alarm was hoisted into its place and rang out the joyous announcement of worship.